After her recent hit production, The Bread The Porridge And The Mix Masala, Melanie Kisten presents Who’s The Boss??? - a lively new dance and comedy musical, with a twist in the tale. This slick production is about three best friends who are bored in their marriages. They find pleasure in card games while meeting to discuss their troubles. A fourth friend invites complications by introducing the idea of having extra-marital flings. They are tricked into believing they have found a happy relationship outside of their marriages, only to discover their perfect lives are turned upside down. The show will appeal to all ages, and is a rollercoaster ride of suspense and betrayal - with emotionally-charged, high energy dance sequences by students of the Melanie Kisten Dance Academy (MKDA). Who’s The Boss??? 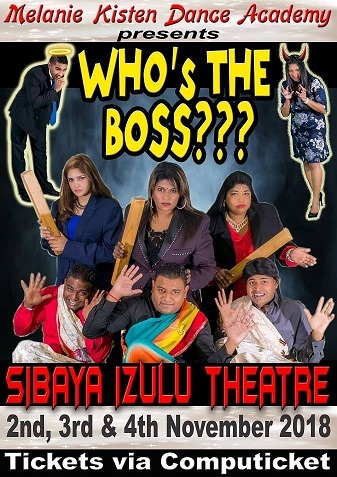 stars Melanie Kisten, Lyle D Chellan, Narusha Chetty, Kubeshan Naidoo, Mayeshini Parusaram, Desiree Kisten - and in their debut performances – Kyle Pillay and Krishna Subrayen. Who’s The Boss??? runs at Sibaya’s iZulu Theatre near Durban from November 2 to 4, 2018. Tickets R130 booked through Computicket (November 3 & 4 are already sold out). Limited tickets left for the November 2. So grab those tickets before it’s too late! The show will begin a national tour after its opening season, with performances scheduled for November 9 at Gold Reef City, and December 1 at Wild Coast Sun. Organisations and Companies that would like to book this team for a corporate event or fundraiser are welcome to email mkda1zn@gmail.com or call 083 235 1207.